The research activities of the MACO team consist in the development of new methodologies for molecular and macromolecular synthesis . Our targets can be natural products or analogues, or substrates displaying interesting biogical and/or physical properties. The privileged skills in our group include organometallic chemistry, focussing on the use of cobalt, platinum, gold, palladium, iron, copper… complexes, radical chemistry (photocatalysis, new mediators) and heterochemistry (oxidized sulfur derivatives and silicon chemistry). Most of our works are supported by calculations and mechanistic studies. The MACO team’s activities are directed towards both the research world at large through their fundamental contributions and the socio-economic world trough their applications. 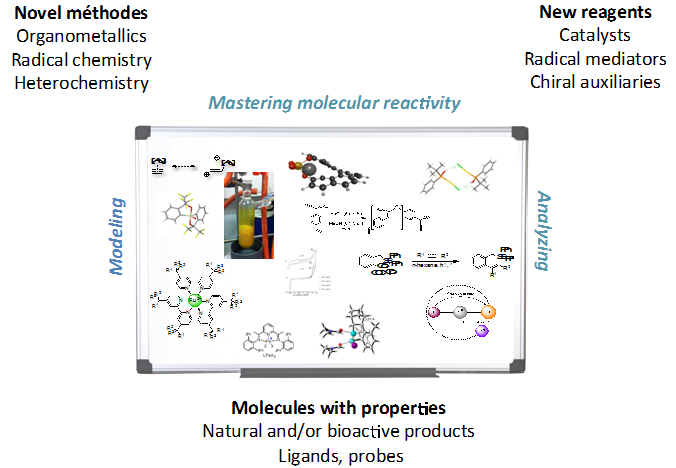 Keywords : radical chemistry, organometallic catalysis, heteroelements, asymmetric synthesis, biologically active molecules, synthetic methodology, multistep synthesis. Areas of expertise : organic chemistry, organometallic catalysis, DFT calculations.